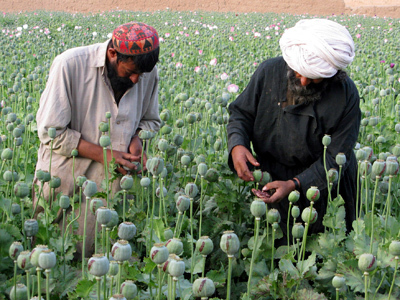 Illegal poppy cultivation in Afghanistan is expected to reach a record high this year. As NATO troops withdraw and the international aid effort winds down, the country’s economy is set to shrink, making other legal crops less attractive. Afghanistan is heading for a near-record opium crop, according to a report by the UN’s Afghanistan Opium Winter Risk Assessment. “Poppy cultivation is not only expected to expand in areas where it already existed in 2012, but also in new areas or areas where poppy cultivation was stopped,” the report said. 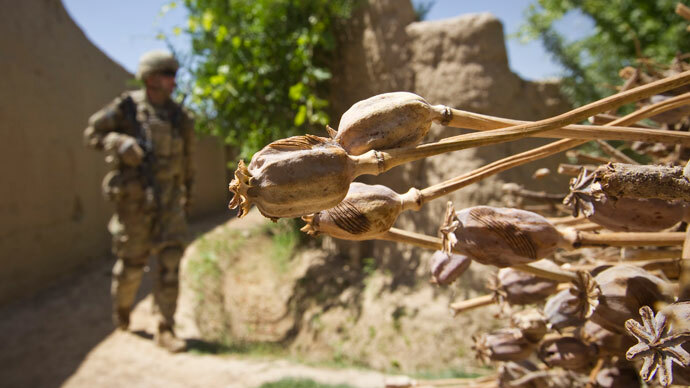 Poppy cultivation is greatest in the Taliban-controlled southern heartlands, in regions where troops in the US-led coalition have either withdrawn are in the process of pulling out, and in areas where there is poor security and little in the way of agricultural aid. Of Afghanistan’s 34 provinces only 14 were expected to remain poppy free, with an increase predicted in 12 and no major change in 7. The western Herat province showed a fall in cultivation, although this is believed to be due to a statistics blip. If there is no disruption to this year’s poppy harvest, Afghanistan will regain its position as producer of 90% of the world’s opium. Afghanistan’s share of the market had slipped to 75%, but this in turn drove up prices to a record $300 per kilogram. Prices have slipped by over $100 but are still at historic levels. “This price is not explainable. Demand in the region and globally is even. There is no demand increase to explain this,” Jean-Luc Lemahieu, head of the UN Office for Drugs and Crime on Afghanistan, told reporters. In addition the bitterly cold winter of 2011-2012 has been followed by a mild one, and expectations of a bumper crop are high. 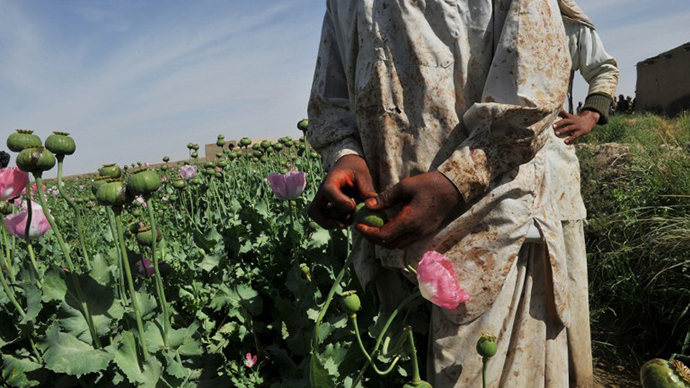 The illegal cultivation of opium poppies is thought to make up about 15% of Afghanistan’s Gross Domestic Product, which in 2012 was about $20 billion. Much of the country’s GDP is funded by foreign investment and when foreign troops leave and international investment into the country drops in 2014 Afghanistan’s real economy is expected to shrink. International donors have agreed to provide about $4 billion annually for few years after 2014 and the US and other countries which have contributed troops have pledged about $4 billion for the Afghan National Security Forces. Afghanistan has a small but effective counter narcotics force, but as crop sales mostly fund local power brokers, criminal gangs and to a lesser degree the Taliban, it makes it difficult for the Afghan government to establish control in areas where the black market opium trade is driving the economy. 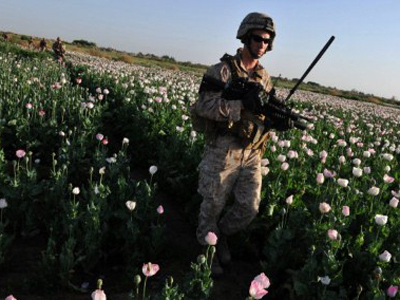 Although the report found that fear of eradication of opium crops had become more significant than in previous years, and therefore made farmers stick to legal crops, overall the government and aid community had not prioritized efforts to cut back the crop, which is feeding the global heroin market. “We need to have counter-narcotics dealt with seriously by the entire government as well as the aid community. One of the big missing links here is providing for the communities themselves,” said Lemahieu. Eradicating the opium crop without giving farmers benefits such as health care, education and support growing other crops, pushes the Taliban and other insurgent groups that tolerate poppy growth into the arms of farmers. Narcotics have the same share in world trade as oil and gas. Since NATO began its campaign in Afghanistan in 2001, more than 1 million people have died as a result of Afghan heroin. 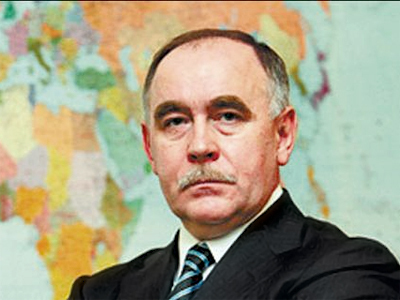 “Afghan heroin has killed more than 1 million people worldwide since ‘Operation Enduring Freedom’ began and over a trillion dollars has been invested into transnational organized crime from drug sales,”Viktor Ivanov, the head of Russia’s Federal Drug Control Service, stated during a presentation to the UN’s Commission on Narcotic Drugs last month. He added that Russia advocated doing in Afghanistan what the US does with the Columbian government in Columbia to destroy Coca plants, namely destroy as many poppy fields in Afghanistan as possible.